So it’s pretty clear from the MRI that the other areas of concern are a problem which makes my cancer multi-focal. The biopsy is cancelled for Monday and I now have a pre-op appointment with my surgeon. Basically this means the lumpectomy is off the table, but I kind of figured that from our first visit with the surgeon. So Mastectomy here we come! I’m thinking of delaying reconstruction so I can focus on recovery, but I reserve the right to change my mind. 🙂 I’m actually pretty ok with all this. If I learned anything from going to the plastic surgeon, it’s that my sense of self worth doesn’t come from my outer appearance. Sure, I like to look nice, but whether I have a real breast, a reconstructed breast, or a prosthesis I can throw in the dishwasher doesn’t matter to me all that much. (I’m not really sure you can throw them in the dishwasher, but wouldn’t that be cool?!? ) The good news is the right side is free of cancer so it gets to stay. You go right side! Plastic surgeons, MRIs and Biopsies, oh my! I don’t have much to say about the plastic surgeon except he is obviously very good at his job, and I’m pretty sure we would never be friends socially. Stay tuned Monday for Stereostatic Biopsy! What I learned at the surgeon’s office today. Man. What a difference a day makes. Seriously. Today I saw my surgeon and she helped remove the brick that has been in my stomach since Friday’s diagnosis. The best words of all were “not lethal”. (Odd word choice, I know. Makes me think of Mel Gibson.) Don’t get me wrong, it’s still dangerous and it’s still scary and it’s still going to be a long haul. But not lethal. She wants to do an MRI and some more biopsies on the calcifications to see if there is more cancer on that side. This will determine whether I get a lumpectomy or a mastectomy. So truthfully, all I really know that I didn’t know yesterday is that I’m going to have surgery and chemo for sure in the next couple weeks. Wait. I did kind of know that. But now I have a plan! And with a plan, I can deal and move forward. I also have an appointment with the plastic surgeon tomorrow (Talk about the cart before the horse. It’s not even gone yet!) and the oncologist next week. Right now it looks like they’ll put my chemo port in at the same time as the surgery so I don’t have to be on the table twice. Fine with me. By the way, I just have to say thank you to everybody for their support this weekend. I cannot tell you how much it means to have so many people thinking and praying for me and my family. I do believe in God and the power of prayer and faith and I just want you all to know that I believe it has and will make a difference. And to just show I haven’t yet lost my sense of humor, here is a picture of my poor son. He’s sicker than a dog. And this is how he fell asleep this afternoon. I didn’t have the heart to move him since he was finally sleeping. It’s cancer. An invasive ductal poorly differentiated carcinoma. Apparently a very aggressive type of cancer. I’m sorry this is so short. I will know more after talking with the surgeon and oncologist next week. 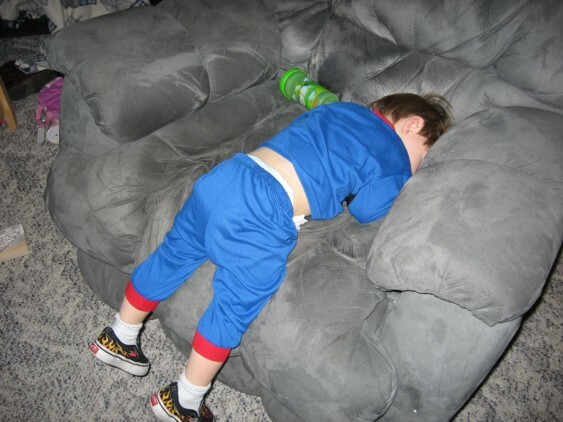 Getting up this morning was a challenge since both kids woke up in the middle of night and ended up with us. It’s like they instinctively know that something is going on and just want to be with us. But I should probably start at the beginning of the story. As most of you know, I went on vacation with my family a few weeks back. What I didn’t add was that the very first night I found a lump. Yep. THAT kind of lump. Since I was out of state and there was really little to do about it, I tried to put it out of my mind, making a little mental note to see the doctor when I got back. Well, 5 or 6 days later, it grew in size. Or at least it seemed bigger to me. This time I called my doctor who immediately sent me to an urgent care facility. Let me tell you, no vacation is complete without a 5 hour trip to an urgent care facility (I got SO much knitting done on Cable Luxe Maxi). And if you’re balking at the 5 hour time, my Mom said we’d probably still be there now if we had gone to the overburdened ER. Anyway, they checked me out and agreed that I should immediately see my doctor when I got home. Which I did. Who immediately set me up for a mammogram and ultrasound. Lutheran Hospital has a GREAT breast care center. I love my nurses who made me feel so comfortable when I was so stressed out. She kept referring to how young I am compared to most of her patients. I don’t get called baby very often anymore. Boosted my self esteem. 🙂 Anyhow, until this point, I pretty much had the attitude that it was nothing, just one of those funny changes our bodies go through. I had my first couple mammograms. Then another. Then the ultrasound. Then they sent me to set up a biopsy, which I really wasn’t prepared for. There could seriously be something wrong with me? All the horrible little morbid thoughts started to creep in as I sat in the parking lot and cried. Since I’m not much of a crier, I didn’t want to go right home and scare the children so I went to Target where I learned that crying apparently ages you about 20 years as the checkout lady thought I would remember oil crisis of the ’70s. Heh. Only if they had an episode of Sesame Street about it. 🙂 Anyway, still not really ready to face the children, I found myself driving, looking for a place where I could calm down. Where’s a knitter to go? Our LYS of course, where the owner immediately could tell that something was wrong, got me some coffee, and let me just defrazzle. She probably doesn’t even know how helpful that was. This brings us to this morning, where I carefully climbed over children and out of bed and headed to the hospital for the biopsy. I had the least invasive kind, an ultrasound needle biopsy where they use an ultrasound to find the lump (stupid lump) and then use the needle to take samples out for testing. Again my nurses and doctor were wonderful. My nurse from yesterday actually came to find me to see how I was doing. Little things like that are so amazing when you go through these things. So tomorrow, I should know. Now I didn’t find my lump (stupid lump) doing my monthly exams like I should, but I had actually remembered to do one the month before so I can say with certainty it wasn’t there then. I am only 33 years old and wasn’t even scheduled for my first mammogram until I’m 40. But here’s the thing, if I hadn’t found this lump (stupid lump), I wouldn’t have gotten a mammogram. And if I hadn’t gotten that, we wouldn’t have found the other three possibly precancerous areas that didn’t show up in a self-exam and wouldn’t have seen for 7 years. Things happen for a reason I guess. SO ladies. We all stink at remembering to do our monthly self-exams. Sometimes it takes knowing someone going through this to make us do it. Now you know someone. Go do it. Oh my gosh! I completely missed that Dec 30th was my Blogiversary! It’s funny to go back and see the things I’ve made over the past year. J has already outgrown the stripey doodlepants and the caliometry has been replaced with my Urchin beret. I’ve learned so many new techniques, met new and interesting people, and even added crochet to my yarny skills. L is getting ready for kindergarten and J is almost speaking people language. So much happens in a year. Anyway, thanks for reading, commenting, and generally making MY day a little more fun. Hooray 1st Blogiversary! 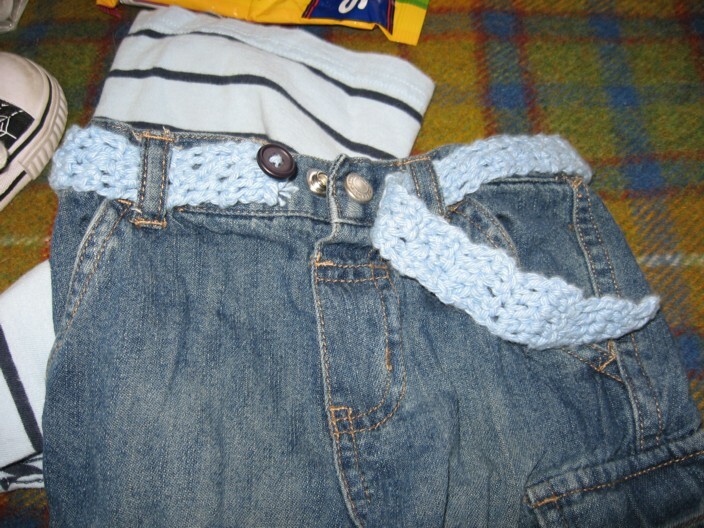 The infamous crocheted vacation belt! So here it is. 🙂 Basically it’s a 4 chain single double ad naseum until it was long enough. I added a few rows of plain old double crochets at the end for button holes which would have been brilliant. Except, I forgot that cotton stretches. Luckily the pattern was holey enough for the button.